The Metro French Roast Blend was carefully roasted for you by Dillanos Coffee Roasters. 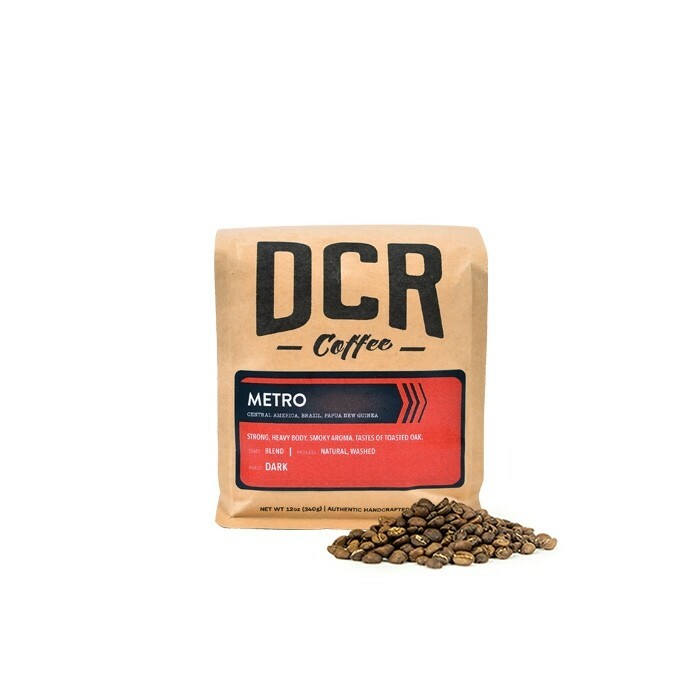 Metro is a blend with strong flavors and intense aroma, appealing to those with a taste for robust coffee. This cup is fantastically bold, with notes of smoke and deeply caramelized sugar. Love how rich and bold this coffee is! This one was a little too bold for our liking. The flavors of this one seemed very forward. Not as smooth as we would have liked. Not as big of fan of this one. Too much smoke for me, not enough nuance. It's a bit too mild for my taste. This coffee is really good. I could stop here and keep getting this coffee but that would be boring. It's heavy without being bitter and has that kick that I like in coffee. Definitely a good match. Good job. I liked it, but my wife didn't really like it. pretty good, a little too smoky though. This coffee is a little too smoky for my personal taste. However, the smoky and Carmel combination are very pleasant and bring a little bit of a woodsy flavor to the brew on my french press. Delightful with a bit of sweet cream on a cold morning! Smokey, bold, smooth and delicious. This dark roast is made for sweatshirts and crisp Fall mornings. Bravo! Tasty, although their Double Dark Blend is my favorite of the two DCR blends so far. So much flavor, and none of the acidity of a typical strong coffee. Absolutely loved this one! Dark enough without any burnt overtones. Brewed in Chemex. Wonderful bold aroma. Full bodied flavor that indeed has a tastes of smoke and I thought was more plum-like than carmelized sugar. With winter just setting in, these are excellent dark bold beans. Smooth and satisfying. Exactly my taste. Perfect but maybe a bit too bold. I think I'd enjoy something more nutty. Very tasty, nice bold flavor. Caffeine burst hits quickly, from the first smell and sip. Definitely could pick up on the caramel notes. Would 100% order this blend again!! Too dark. Might be better for an espresso but I didn't like it for a pourover. I am a rookie at this so bare with me. I enjoyed how clean the coffee taste. There was no lingering after taste. It had a full coffee taste which I liked. I drank it black after a coarse grind and through a French press. I think I would enjoy slightly bolder and darker. I felt this was too strong for me. Friends loved it, but wasn't my favorite. I like extra bold flavor, but I'm not a big fan of caramel flavor. Good and dark but would like to try some other "bold" coffees that aren't French roasts. Sorry, not a refined palate to give better descriptions. It taste so fresh it is amazing! We really like the bold flavor of it and how fresh it taste. Love how smooth this coffee is. It's full in taste yet quite light in how it feels once you take a sip. Decent dark roast with bold flavors. I like dark full body coffees and this coffee met my expectations. Nice balance and flavor. Would like to try another coffee that is a little more bold. Super rich but mellow. A bit on the over-roasted side (for my tastes). I always have a hard time with French Roasts going too bitter or smoky. And there's a bit of that with this one. But I'd buy it again. Has a good balance. Not overpowering for first thing in the AM and translates well to late morning on days off. Medium smoke and roastiness. Best enjoyed from the French press! Love this strong bold coffee. Enjoyed this blend more than the first (Atomic). Like the dark rich color of the bean. Have me more of the bold taste I enjoy. Added cinnamon sticks when grinding which gave it even more flavor. Thank you. Enjoying the strong classic French roast. This makes an awesome pourover. Love the mouthfeel and finish! Very good coffee. I wish it was just a little stronger however. Excellent blend. Bold and robust. Loved it. I like that I can taste sweet and savory in one sip. I like the smoky, nutty flavors. I really liked the richness this coffee had but it still isn’t quite as strong as I would like it to be without basically turning it into sludge by using more grounds. This tastes burned as if it was made on a drip machine and just sat on one of those heated pots at a gas station for an entire day. I do not like it at all. Note that the coffee likely isn't bad, just that this is such a dark roast that to me it is does not have an appealing taste. I've had three cups over two days and don't think I will drink any more. Spicy,but smooth. Heavy body vanilla,velvety aftertaste. Late night company if you dare. Not the biggest fan of the smokiness. Bice rich experience. Bold but smooth. Did not get the aroma I was looking for in a good, freshly roasted bean and it translated into a good cup of coffee that didn't inspire. Smooth and easy to drink...but not full of flavor. It seems like a good medium blend but did not have a lot of the strong notes that I prefer. Did not really taste the smoky or bold flavor...looking for something a little more robust. Not a huge fan of french roasts. This coffee was delicious. Definitely would love to have this one again sometime!! Got the caramelized sugar notes not so much the smokiness but I thoroughly enjoyed this one!! This coffee was wonderful. It is so smoky and roasty. Perfect to wake you up in the morning. I enjoyed the strong taste. It's too bold to make iced coffee out of, but for drinking hot it is pretty much perfect. Seemed like it would take a lot of grounds per pot to get a full flavor out of it. Smelled good, but drinking it felt quite flat, and if the brewing instructions on the bag are to be believed, the flavor is not matching with our palette. Enjoyed this cup, it was definitely on the darker end, French roasts are typically not my favorite, they can veer towards tasting a little burnt to me, but this one was quite enjoyable. Good job! maybe a little less bold on next one? can't tell if is the boldness or smokyness that i am not exactly thrilled with? The only flavor that I pulled out of the coffee was the smokiness. It was just a bit too bitter and harsh for my liking. Overall good, but not a standout. Bold, full-bodied flavor, great for a first morning cup. Good flavor that's stable and perfect for mornings. What I expect in a good breakfast place. Didn't wow me, but overall a good coffee. So I really liked the fact that this was a true dark, bold roast - I've been sampling lots of different coffees in lieu of my normal Peet's and so many of the "darK" or "rich" roasts taste really thin or pallid to me. (I'm particularly disappointed when I'm promised "fudgy" and I get a wan brew!) So I like the "robustness" of this coffee. But I find that like most French roasts that I've tried it has a bit of - not sure of what the exact coffee aficionado terminology is here - bitterness? Acidity? Sharpness? Bite? Which I find to be true with the Peet's French roast too, which unlike the Dillard's, just takes burnt to me. Bottom line: while I'm enjoying this it wouldn't replace my normal Major Dickinson's or Sumatra. Strong flavors and intense aroma. An excellent example of a superior dark roast! For those who prefer "the dark side," I recommend you try it. Too dark and oily for my taste. Smoke is not a flavor I particularly enjoy in a cup of coffee. I liked this coffee. It does have a smooth taste and good flavors. I do taste the caramel hints. I didn't think it was overly bold. It's a good cup of coffee, didn't blow my socks off but good coffee. I tasted the caramel more than other notes. Not a big fan of French Roast; wouldn't choose it again, but it was the best French Roast I have ever had. Maybe a blend? The Metro French Roast Blend is absolutely delicious. No bitterness, just great flavors. Wonderful coffee! I ordered more direct from their website. Thanks for the introduction to this delicious blend! I love how strong this coffee is! I really liked this one! The French Roast is obviously my taste choice. Today I also tried the third you sent (Tony's Coffee) which also was good, but the Metro would be my pick of the two. If I asked what is the "boldest" French/Dark Roast you offer what would be your opinion? All your coffees are excellent, so this is really in the "opinion" realm. I am very pleased with this coffee. I like the strong flavors I can taste in it. It does not have the bitter taste i have experienced with other strong coffees. I didn't think this blend had much flavor at all. I even used way more than recommended the second time and didn't notice a difference. Nice smooth flavor. Not bitter. Very much enjoyed this coffee. Very good French Roast. Tastes as advertised. Brewed with a Chemex. Definitely up my alley. Easy to identify the smoky notes. Ok Coffee, but found the flavor to be a little shallow. Lacked depth and complexity. Thank you we loved the flavor! Can't wait to taste what's next!! Had my first two cups this morning. VERY good. Very Aromatic and smoky. Great dark coffee. Personally don't like the bitter caramel taste but love the smokiness of this coffee. When you open the bag, there is very little coffee aroma. The coffee is smooth and not acidic, but definitely not bold nor smoky. The caramel barely comes through. It is bold, which is great, but has a lingering taste that I could do without. I used a conical burr grinder and a french press to make this coffee. It was good with notes of smoke and chocolate, almost the caramelized sugar described, but was not very complex. The two flavors were good and strong but left me wanting something to softly finish at the end and round it out. Overall a good coffee that would go great with a rich dessert and is good on a cold morning with a cigar. Not the biggest dark roast fan! Tasted great, not as strong as I expected, but it was still smooth, had the caramel taste, and is great black! This coffee really hits the sweet spot of what I love about dark coffee. If I manage to do it right, it's smokey with some kind of sweet chocolate or caramel woven in. A very pleasant full flavor where you can sit and ponder it while you sip. The Metro French Roast is the clear winner when comparing the coffees we've been sent. Please keep that in mind for our futures shipments. The previous coffees were a little too weak for our taste. Thanks and we look forward to our next beans from you! No bitterness whatsoever. The flavor was complex and I could actually identify the smoky flavor. It was bold but don't be afraid to go even bolder! Nothing particularly exceptional about this coffee. Good blend. Even my wife, who is quick picky, liked it. I like a coffee that tastes like coffee. This works. This coffee was a little to dark bold and smokey for me. found the aroma very inviting, the taste was lacking however. did not get the smoky, caramel or bold flavor when drinking. A little too dark of a roast for my taste. I preferred the Smooth Operator from Brazil Cocarive Co-Op much more. Excellent taste and aroma! Bold cup of coffee! Nice and smooth, good flavors. Love a good dark roast that doesn't taste burnt. Found it a bit light, I like my coffee stronger. Fantastic smell, taste & freshness knocked this one out of the ballpark!!! Produced a good cup via pour over and paper filter (didn't care for it with a metal filter). Fantastically bold is certainly applicable; honestly the smokey bitterness overwhelmed the more subtle caramel notes until I went to an extreme with a more course grind and cooler slurry temps. After dialing things in, I definitely agree with the notes of caramelized sugar; it's distinctly unique. Overall, I enjoyed the coffee, but likely won't serve this to guests with less adventurous tastes. Not dark enough for my taste. Sort of flavorless compared to what I'm used to. It's just ok not my favorite. I love this blend! Can't wait to try the next one! I really liked the bold flavor and smooth finish of this one! Very smooth, however not as bold or rich as I had hoped. One of the best roasts that I've had. had too much smoke to it - almost a burnt flavor which lingered after. Love Dillanos Metro French Roast Blend! I knew I would when I opened the bag! It smelled so fabulous! The beans grounded so quickly! Is that due to its freshness or the type of bean? Just curious. I love the boldness and smokiness flavors! Great job! Love it! Really good but I like more of a punch in the mouth when it comes to flavor from a dark roast. Tasty enough. Not as bold as I would have liked and maybe almost too oily. This was fine, not my favorite thing ever but I don't know why? Sorry - I don't really have an articulated palate yet! Really good blend. Works well as a regular and cold brew. Strong taste with no lingering aftertaste, which I like. Disappointed. Perhaps the hype, but coffee did not seem "robust". maybe even "old"
This was a better brew than the previous. I have learned to drink without additives giving me a better understanding of the flavors I prefer. This coffee was right on point with the flavor profile that we typically enjoy. The dark, strong beans and the caramel notes are something we really like in our coffee. Good all around, but could go a bit stronger. I really enjoyed this blend. Not bitter or acidic ; bold but not too strong. It's creamy and a little sweet and I could definitely detect a little of the caramel. I love how bold and rich this coffee is! I gave it 4 as opposed to 5 stars only because there was something very unique about the Blue Heeler coffee which I felt like I was comparing it against. Very good French roast. Still slightly a little too oily though. I felt the need to blend it some more for more balance. Strong, bold taste, a little sour. Earthy flavor. Very good french roast, personally interested in a stronger non-artifical flavor. Very dark and bold, needed to assist the amount of coffee we use because it was overwhelming. Very bold classic French Roast. Oily and dark and robust. Only brewed this up in the Clever so far but intend to run it through the Aeropress as well as a drip machine to see how it goes. Loved the dark flavor and smooth mouthfeel. Such a pleasant surprise as my first entry into Mistobox. This was a wonderfully strong and rich blend.. This blend was a bit too bold for my tastes. The density reminds me of bottom of the pot coffee :(. Very bold, very nice on a cold winter morning in Wisconsin! Rich and robust, but still has character and subtlety. Just like I like it! Very little flavor, basically tasted like water, we even made less cups and made it stronger, to no avail. Much better! Slightly lighter in color, somewhat less robust, than what we would consider ideal. But, excellent nonetheless. Thanks! Very good first choice. Looking forward to the second shipment. I enjoyed this coffee, but didn't feel like it was bold enough for me. Is that just crazy? It does taste very fresh and wakes me up, but I feel I need to make sure I put in extra beans to really get a full flavor. Thank you for taking the time to choose though! Flavor is nice but when using with my Keurig it tastes weaker than I prefer. I have the Keurig pod to use coffee grounds instead of store bought pods and use it with the medium size cup brew. Enjoyed Dillanos very much. Strong and bold but no bitter or burnt notes like starbukcs coffee tend to have. This coffee has a unique flavor that I did enjoy although it was a bit lighter than I expected. love how bold it was. just like its description it had that "robust" feel and taste! Love this process, loved this coffee! French roast is a solid bold coffee but not overly exciting. A good standard cup. Loved it! Strong bold flavor that had a lot of body without any bitter aftertaste. Loved the smokey caramel notes. On point mistobox. Thank you! Can't wait for the next one!!! Very nice. Smooth. Not the darkest thing I've had. Looking forward to drinking more. This was very goood and made us like the blends. Great choice. Robust dark aromas and a good balance of sweet fruit up front and a bitter back end. A great blend for a medium-bodied cup. Love this coffee. Strong robust flavor without any of that bitter or acid-y aftertaste you sometimes get with strong coffee. I highly recommend this coffee to myself. Found the French toast to be a bit light for my taste. Bold and flavorful. I taste dark chocolate followed by smoky richness. Great way to start the day. I've enjoyed this coffee, probably my favorite of the Dillanos so far. Better than the Cafe Kaldi, worse than the Atomic Blend. Not acidic or sour. But smelled burnt. Tasted sooty. Had a bit of the flavor of ash. The color of the bean had a nice darkness. The Metro blend was my second favorite roast so far (after the Corsica blend). It wasn't acidic at all, which was great, and very roasty. The beans were about the same color of coffees that I usually like. I enjoyed the super dark roast, but I might like something with just a tiny bit fuller body/more nuttiness and sweetness. But this is roast is great! I liked this one. Seemed a little more mellow at first, although a little more bitter than what I'm used to. Had a nice finish. Full-bodied, dark, no acidity - everything I love in a cup of coffee! It's good, but it depends on how it's brewed. When used for espresso, it's very robust and flavorful. But when used with my Kuerig in a single cup pod, I found it to be pretty weak. I'm hoping to find a blend that can be used for both machines. Tomorrow I'll try adjusting the coarseness of the blend to see if that helps. An excellent coffee no matter how you brew it. Drip, french press, or perculator. It was a nice dark roast without being bitter. Lovely coffee. Absolutely love this coffee! Very dark and rich, smoky without any bitterness. I usually drink my coffee black but sometimes add a bit of heavy cream; this coffee is delicious either way. the description on bag is accurate, though I added more ground beans to my drip coffee maker. Bold but not bitter, somedays it seems complex, other days straightforward. Allergies make the difference, I'm sure. But a very pleasant experience. Enjoying a pot right now. Loved this one! Kept smelling it in the kitchen through the sealed bag! Dark, bold and rich, this was a great choice! Excellent coffee!!! What an awesome choice to start my subscription with! It is bold and robust....just the way I like it. Definitely a favorite. Perfect! This is everything I was ultimately hoping for. Full body, bold, and full of flavor. For the next shipment, something similar to this. I would even take another of this one! I enjoyed this blend. Usually I shy away from a French Roast because some tend to be really over roasted and have a distasteful smoky taste. However, this blend was well balanced and light on acidity. Now this is a fantastic cup of coffee. Dark, smokey, bold. Absolutely delicious. I really like it! It's so smooth and bold, and the aroma is wonderful. Excellent. Ground up beautifully as well. Excellent flavor, full body, delicious! Taste is good and smooth - nothing too powerful, but still tasty and smooth. Aroma is a little strange, but flavor is good. As far as French Roast go, this has it all! Every sip is a delicious coffee party! Brewed well in the Chemex. Initially a thought of "bitter" to our untrained palette, though we eventually decided that was the strength of the coffee. Question: I think we asked for medium roast, but this was a bold? It's good, but it wasn't anything special. I don't know that I've ever had a distinctively interesting French Roast. Not sure that we'll buy it, but we enjoyed the opportunity to try it. Everything as promised. A full flavor, non bitter satisfying cup. Great throughout the day. Loved it! I'm sure this will be one I keep in my repertoire Great first choice from Seth. The description nailed it. Was great for the french press and delivered a bold but never overbearing, fully flavorful cup each time. Very, very happy. Nice and robust. Very dark roast. A nice french roast. I would give it 5 stars if it was a little darker and bolder. The flavor of this coffee isn't bad. But I really don't taste a strong coffee like it says. It's not very bold flavor in my opinion. And it also makes my stomach upset. Not something I would like again. Dark and full bodied. Very tasty! It's a hit! Smooth, dark, rich, but not overpowering. This is really close to what I consider to be a good cup of coffee. Really enjoyed the smoky boldness throughout the entirety of the drink. It worked well as an espresso shot, off the drip cone, and the French press and the taste was versatile enough to translate across all three. This is the one that I've been waiting for- the one that made me go "WOW!" It makes a perfect cup for me!!! Metro blend: Nutty (pistachio?!). Dark and bitter but in a good way. Smooth. My second favourite among these four. While obviously a quality coffee, I am not a fan of the taste and would prefer to not receive anything like this in the future. Excellent roast. Smooth, dark and rich. Definitely buying a full bag of this! Bold flavor was just right. An amazing coffee...possibly the best cup of coffee I have ever tasted. The smooth but bold flavor is a great way to wake up in the morning and the smokiness of it makes it almost perfect. Love it!!!!! Definitely a good balanced blend, will enjoy every cup. However, it lacked character. Seemed kinda plain and lacked great strong bold flavors that I was hoping for. measure appropriately with this one, it is bold! 4.5 stars. I really liked this cup! Dark and smooth. I like the nutty-ness of this coffee. It's a good, solid coffee for French Press. I'm missing a little earthiness that would bring it over the top. Good, strong flavor and not acidic. But it's a little overbearing and lingers a little longer than we'd like. I like that this coffee is strong, it was a little too robust and smokey for me to give it 5 stars, but I still enjoyed it and it was very smooth. This would be amazing brewed over a campfire for sure. Some of the best coffee I have ever tasted! As soon as I brewed my first batch my coworkers were asking "what coffee is THAT"!?!?! Good Flavor but lacks Character. Brewed with AeroPress (Inverted Method) using a Fine Grind (Burr Grinder). A bit too smokey for me. It felt like I was drinking a campfire at times! As I got more used to it, I enjoyed it more. Still, it's not one I'd like again. Loved the flavor as it hit the palette but it seemed to dissipate quickly which led me to drink it a lot faster than normal. I really like it, but don't love it. It smells AMAZING, but the taste doesn't come across as amazing/strong as it smells. Definitely get the "intense campfire aroma" which spills over to the taste. Too smoky for our taste. Yes, robust...but not the way we prefer it. Great aroma! A strong roast, slightly weak, lacking in acidity. Overall, delicious and pleasant. We really enjoyed this coffee. These beans had an almost smoky scent when I opened the bag. The dark, oily beans brewed dark brown and made the house smell amazing. The flavor was rich and complex with a roasty finish that lingers in your mouth. This was my favorite blend of the four in my May box. Good, but ultimately finished a bit too smoky for my liking,. Very oily beans. Wonderful scent. A strong cup with subtle flavors. It was a strong flavor coffee with the dark roast. I like dark roast as a full city roast versus a french roast. Strong and bold coffee that went well with my French Press method and made pretty good ice coffee. However the coffee had a strong aftertaste of ash or smoke which I didn't like very much.